Pathwari Devi temple, Mathura is situated near Akashvani radio station. This is one of the ancient temples of Mathura. According to local people, number of devotees and pilgrims visiting this temple has increased in present as compared to the past. While some people worship Lord Ganesha before starting any auspicious work, some others worship Goddess Pathwari. It is believed that before commencing any auspicious work, if Goddess Pathwari is worshipped then all obstacles in the path are overcome. Because this deity shows the right path to her devotees, this is why She is renowned as ‘Pathwari’ (Path Showing). Pilgrims first visit and worship Goddess Pathwari before commencing their pilgrimage to make it successful. During wedding time, bride and bridegroom’s families visit Goddess Pathwari temple and invite her to the wedding and other celebrations by presenting the first invitation card to the deity. In Past, Goddess Pathwari temple was situated near to the confluence of Saraswati Kund and Mahavidya Kund in Mathura. Hence, Goddess Pathwari was once also known as ‘Mahavidya Saraswati’ in Mathura. The Goddess of the path is generally found in most of the north Indian towns and villages in the form of a small squared earthen or stone structure. Goddess Pathwari temple in Mathura was renovated in the year 1888 by devotees from Agra. It is believed that Mathura’s first 'Nav Kundiya Sahastra Chandi Mahayag' was performed in this temple in the year 2002. Devotees and pilgrims visiting this temple can also sight idols of Hanuman carrying Sanjeevani Mountain, Bhairavnath and Languriya holding flag in hand. At present, Lalitamahatripur Sundari temple is also under construction. 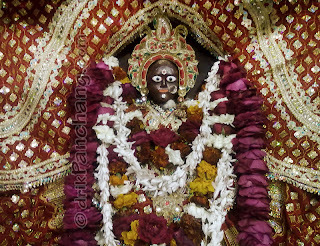 During Navratri, various Banglas (बंगला) are organized in this temple. Different Banglas are made with dry fruits, pulses, rice, vegetables, fruits, flowers and sweets. During Chaita Navratri, devotees from outstations like Agra, Hathras, Dauji and other nearby places, especially come to Mathura to visit this temple. Devotees flock to this temple during Navratri and New Year and make offerings to Goddess Pathwari in all forms e.g. cash, sweet delicacies, fruits and flowers according to their capacity.